The Set-Up: Si discovers YouTube and wants to put up instructional videos. John Luke destroys Willie’s truck in an accident. Hilarity Ensues: Si decides most of the stuff on YouTube isn’t much good, even though he quotes YouTube favorites like “Charlie Bit Me” and “Double Rainbow,” and decides to do a series of golfing instructional videos. The Duck Dynasty boys, ever looking for distraction from their “work,” decide to act as Si’s film crew. 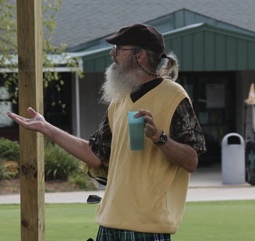 Si appears dressed as a backwoods version of Payne Stewart, and proceeds to make the most useless golf instructional videos since Tim Conway’s Dorf on Golf. Meanwhile, as Willie foes for a loaner truck to replace the one John Luke destroyed, he has to take Jep’s young kids across town to his parents’ home. Willie foolishly buys them ice cream and pays the price as the trash the loaner truck. Looks like typical Louisiana driving to me. What’s a miracle if John Luke really totaled that truck is that his parents wouldn’t take his license, put him in driving school, and extract some of the cost out of his hide in the form of Victorian workhouse-style manual labor. The Christian Angle: The “miracle” argument is interesting, as Korie insists her son not being injured in the wreck was a miracle and Willie disagreeing. Willie says it was a miracle when John Luke was born, but not when he wrecked his truck. This perhaps reflects the tendency for the Duck Dynasty men to see God’s presence in the natural events of the world, rather than in lightning-strike supernatural moments. The Wrap-Up: The “Season Finale” of Duck Dynasty will be the Halloween special, airing this Wednesday. Probably the next episode will be a Christmas special, followed by more episodes in the spring.